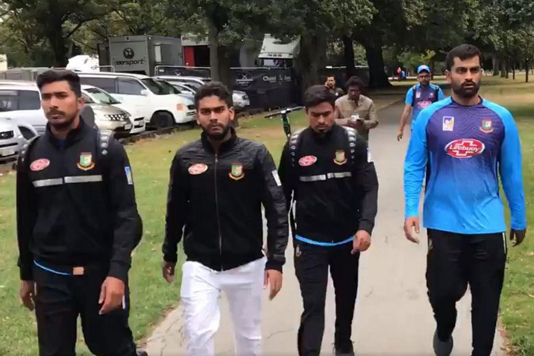 Following gruesome terrorist attacks on two Mosques in Christchurch today, Bangladesh High Commission in Canberra is intensely engaged with the New Zealand authorities for safety of members of Bangladesh diaspora and early safe exit of the Bangladesh national cricket team from New Zealand. The two attacks were made at Masjid Al Noor and Deans Avenue Mosque during the Friday prayers. The incident had happened minutes before the Bangladesh cricket team arrived at the mosque. The team members are safe at Hotel, though traumatised. New Zealand Police has assigned dedicated security personnel for the team, a media release has confirmed. New Zealand Cricket, in consultation with Bangladesh Cricket Board, is making arrangement for their safe exit early. Among the casualties (about 50) there are reports of death of three persons of Bangladesh origin, and a few are critically injured. We still await details of them from the New Zealand security officials and hospital authorities officially. The High Commission directly and through the Honorary Consul of Bangladesh in Auckland disseminated message to the Bangladeshis and diaspora living in New Zealand in general and Christchurch in particular to remain calm, be indoor, avoid places of congregation and to obey the instructions of the law enforcers. The Honorary Consul of Bangladesh Shafiqur Rahman will arrive at Christchurch tomorrow morning to extend support to the Bangladeshi victims. He may be contacted at his mobile phone number +64 21024 65819. Deputy High Commissioner Tareq Ahmed along with a Consular officer of the High Commission will also proceed to Christchurch at the earliest possible time tomorrow to provide all kinds of support. Mr. Ahmed may be contacted at his mobile phone number +61 450 657 046. Additionally, all the diplomats at Bangladesh High Commission, Canberra are available round the clock for information and assistance. Two additional numbers for emergency contact are +61 424 472544, +61 450173035.